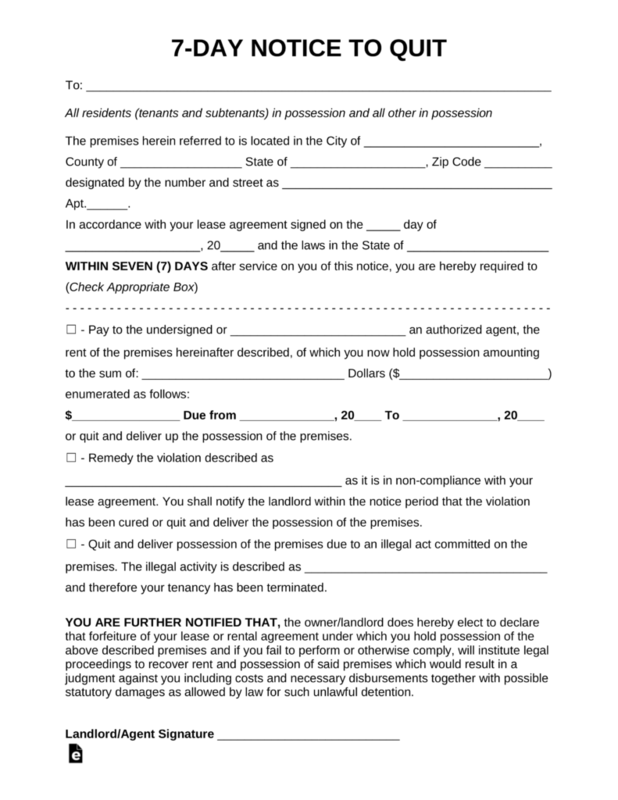 The seven (7) day notice eviction template is a document that allows a landlord, or their representative, to give attention to a matter that is in violation by the tenant. The most common matter is the non-payment of rent but can be for any lease violation. Most issues are curable, which means they can be fixed by the tenant within the seven (7) day time period. Unless, it is an illegal act, then the tenant will be asked to leave. If the tenant does not cure the issue or vacate the premises within the period allowed the landlord may file eviction proceedings which commonly known as a ‘Forcible Entry and Detainer’ or simply an ‘FED’. Step 1 – Before writing, ensure that the seven (7) day notice period is legal in the State the residence is located. After verification of the laws, the form should be filled-in according to the following instructions by simply writing in the blanks of the tenant and the residence. Step 2 – In the header area of the form, the name(s) of the tenant should be inputted into the document along with the residence they occupy. The original lease date (when it was signed) should be entered and then the landlord may enter in the following sections the type of infraction the tenant violated. 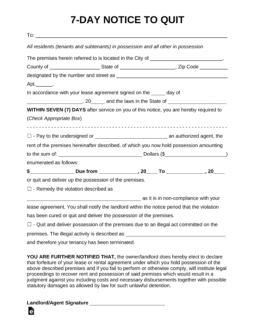 The landlord should sign the bottom of the document and move to the second (2nd) page, known as the ‘Certificate of Service’, used for serving the tenant. At the end of the seven (7) day period, starting when the tenant receives notice, the tenant shall have either fixed the violation (if applicable) or vacated the premises. If the tenant has not done either the landlord may file a forcible entry and detainer (FED) with their respective court clerk’s office.